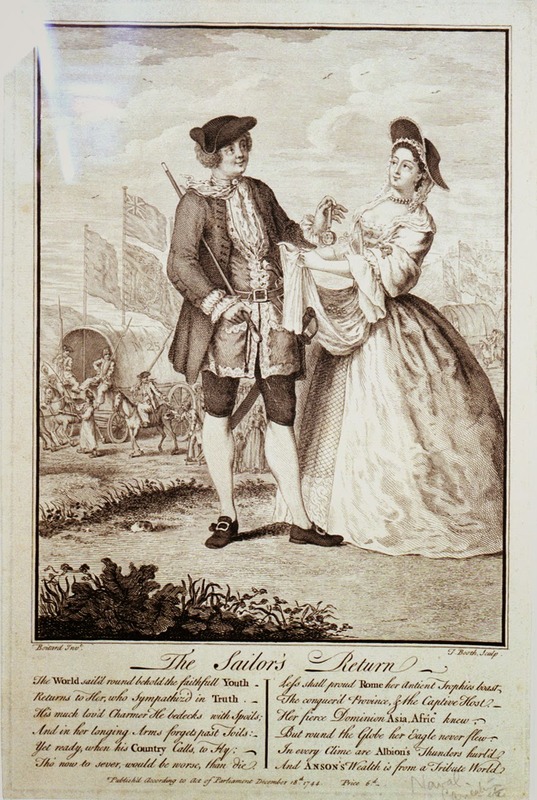 The Sailor's Return, Louis Pierre Boitard, 1744, National Maritime Museum. If not for the fact that this print explicitly states that its subject were a sailor, one could easily think he was not. Our tar hands a watch to a smiling lass, who extends her apron filled with coins to accept it. Behind them rolls a wagon with a guard of sailors, atop which flies a captured Spanish flag beneath a triumphant British one. The most obvious tip-off to our subject being a sailor is the cocked hat. Untrimmed and reversed, it is the same as those worn by the more conservatively dressed jacks in the background (who wear jackets and trousers, though there isn't enough to detail to say much more about them). The sailor's white neckcloth blows over his right shoulder, and his long coat and waistcoat are very fine for his lowly position. Tucked beneath his arm is a fine walking stick, tucked under the arm in the same fashion as sailors with far less impressive sticks. Another hint to his profession is the belt around his waist, which holds a cutlass and pistol. His breeches match the hue of his jacket (likely blue), and his white stockings lead to round toed shoes.